The silver used by Beth Gwinn’s research group at UC Santa Barbara has value far beyond its worth as a commodity, even though it’s used in very small amounts. The team’s latest research is published in a featured article in this month’s issue of ACS Nano, a journal of the American Chemical Society. The scientists positioned silver clusters at programmed sites on a nanoscale breadboard, a construction base for prototyping of photonics and electronics. 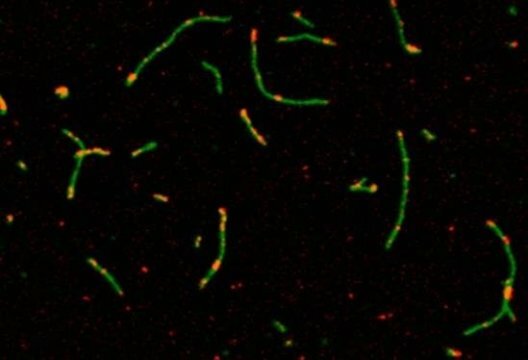 “Our ‘breadboard’ is a DNA nanotube with spaces programmed 7 nanometers apart,” said lead author Stacy Copp, a graduate student in UCSB’s Department of Physics. DNA nanotubes were decorated by silver clusters with DNA-programmed color. The above story is based on materials provided by University of California – Santa Barbara. Source: American Chemical Society Summary: The global industrial sector accounts for more than half of the total energy used every year. Now scientists are inventing a new artificial photosynthetic system that could one day reduce industry’s dependence on fossil fuel-derived energy by powering part of the sector with solar energy and bacteria. The system converts light and carbon dioxide into building blocks for plastics, pharmaceuticals and fuels — all without electricity. 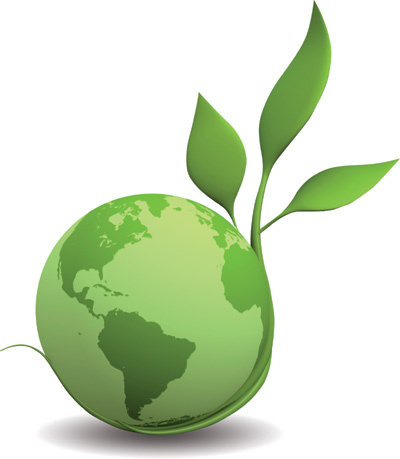 The global industrial sector accounts for more than half of the total energy used every year. Now scientists are inventing a new artificial photosynthetic system that could one day reduce industry’s dependence on fossil fuel-derived energy by powering part of the sector with solar energy and bacteria. In the ACS journal Nano Letters, they describe a novel system that converts light and carbon dioxide into building blocks for plastics, pharmaceuticals and fuels — all without electricity. 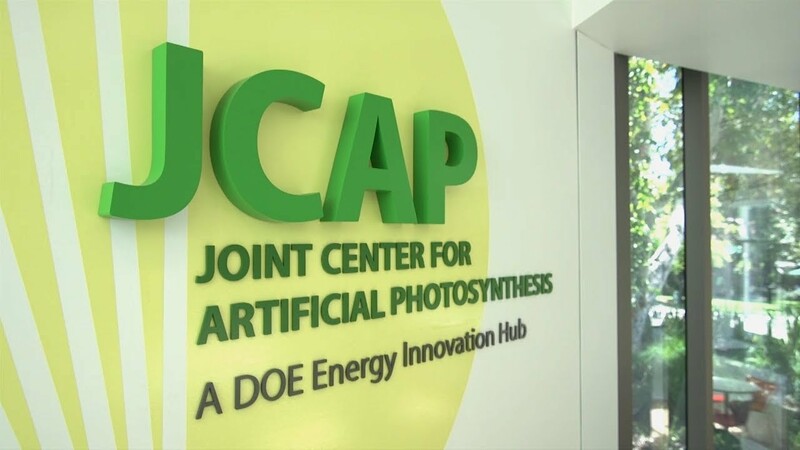 Peidong Yang, Michelle C. Y. Chang, Christopher J. Chang and colleagues note that plants use photosynthesis to convert sunlight, water and carbon dioxide to make their own fuel in the form of carbohydrates. Globally, this natural process harvests 130 Terawatts of solar energy. If scientists could figure out how to harness just a fraction of that amount to make fuels and power industrial processes, they could dramatically cut our reliance on fossil fuels. So, Yang, Michelle Chang and Christopher Chang’s teams wanted to contribute to these efforts. 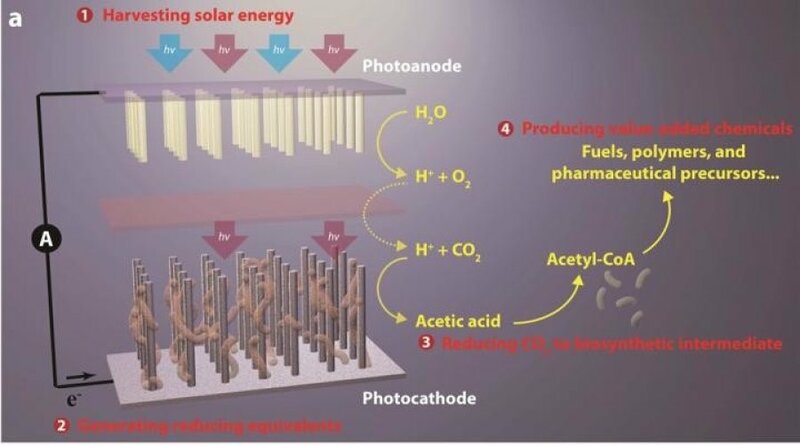 The groups developed a stand-alone, nanowire array that captures light and with the help of bacteria, converts carbon dioxide into acetate. The bacteria directly interact with light-absorbing materials, which the researchers say is the first example of “microbial photo-electrosynthesis.” Another kind of bacteria then transforms the acetate into chemical precursors that can be used to make a wide range of everyday products from antibiotics to paints. The approaching water crisis will be solved by devices made possible by nanotechnology. Since its conception concerns have been raised about nanotechnology’s potentially deleterious impact on the environment, but at this point it looks as though it will do more good than harm. From water remediation to solar cells to pollutant monitoring, nanotechnology, as I wrote in a recent blog entry, presents humanity with a “bevy of Black Swans.” The world’s fresh water supply is dwindling. Nanotech devices can empower governments and individuals around the world to use otherwise untapped sources through desalination and reclamation. Zhang calls the scale of groundwater pollution “enormous” and the complexity “seemingly intractable.” Of the hundreds of thousands of sites in the United States identified by environmental agencies over the last three decades less than one third have been restored. Old mining areas, factories, landfills and dumping grounds continue to increase. As well as obvious undesirables like pathogens and heavy metals, more modern toxins, like endocrine disruptors and pharmaceuticals, must also be removed. While infrastructure improvements are necessary and inevitable in many places, nanotech research will accelerate, and be expedited by, the decentralization of water treatment. Nanofiltration involves using membranes with tiny pores (1-10 NM across) to remove specific molecules from a solution. Among other applications they are used to separate whey from the other constituents of milk and antibiotics from salty waste products. The major advantage they have over their competitors is the amount of pressure needed to pass liquid through them. Carbon nanotube membranes can remove an assortment of contaminants and aluminum based nanostructures are good at dismantling negatively charged baddies like viruses and bacteria, as well as some organic and inorganic compounds. Biomagnetite removes chlorinated organic molecules, silver slays bacteria and titanium dioxide, which is already used in a variety of consumer and industrial products, can break down organic compounds. Dr. Sujoy Das assembled a silica-silver nanocomposite via biosynthesis. In other words, its production is cheap and green. The proteins covering the nanoparticles prevent them from leaching into the water. They also function as both reducing and protective agents for the silver nanoparticles. The nanocomposite removes dyes and microorganisms quickly. Moreover, the material can be reused several times.The LifeSaver bottle, invented shortly after hurricane Katrina, removes objects larger than 15 nanometers and works well for up to 1,500 gallons. It does not take out salt or some metals, however. This is unfortunate as in many regions the ocean is the only option. Yet desalination is costly. It requires approximately 12 times the electricity needed to prepare fresh water for consumption. There is also the large initial investment of 200 million dollars or more to build a plant. Although for a glass of water 3 kilowatt hours is not bad at all, desalination is unfeasible on a large scale. Perforene, a graphene nanomembrane developed by Lockheed-Martin, was originally touted as being 100 times more efficient than other methods, but this estimate was later lowered to 20%. Thus, the enthusiasm was massively excessive and woefully premature. Yet this should not discourage. Every boom, or potential boom industry, has its share of exaggerated but stock boosting announcements, and does not mitigate the promise held by the technology in question. Baines, Lawrence. “The Fight for Water.” Project-Based Writing in Science. SensePublishers, 2014. 81-89. Cohen-Tanugi, David, and Jeffrey C. Grossman. “Water desalination across nanoporous graphene.” Nano letters 12.7 (2012): 3602-3608. Inderscience Publishers. “Nanotechnology for water purification.” ScienceDaily. ScienceDaily, 28 July 2010. .
R. K. Joshi, P. Carbone, F. C. Wang, V. G. Kravets, Y. Su, I. V. Grigorieva, H. A. Wu, A. K. “Precise and Ultrafast Molecular Sieving through Graphene Oxide Membranes” Geim and R. R. Nair, Science, 2014. Qu, Xiaolei, Pedro JJ Alvarez, and Qilin Li. 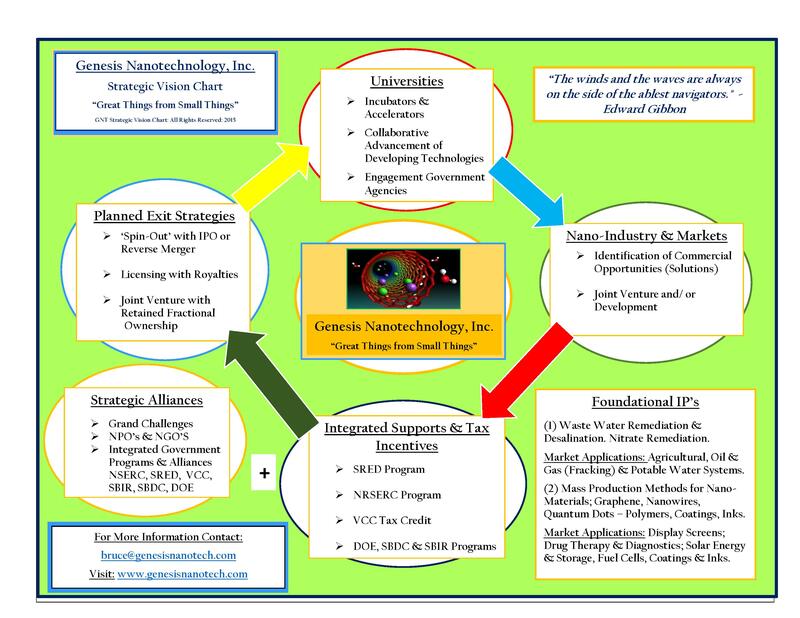 “Applications of nanotechnology in water and wastewater treatment.” water research 47.12 (2013): 3931-3946. 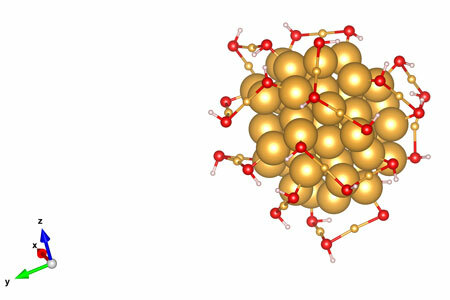 This rendering shows the atomic arrangements of a gold nanocluster as reported in a new study led by UNL chemist Xiao Cheng Zeng. The cluster measures about 1.7 nanometers long – roughly the same length that a human fingernail grows in two seconds. The researchers reported their findings in the April 24 edition of Science Advances (“Unraveling structures of protection ligands on gold nanoparticle Au68(SH)32“), an online journal from the American Association for the Advancement of Science. 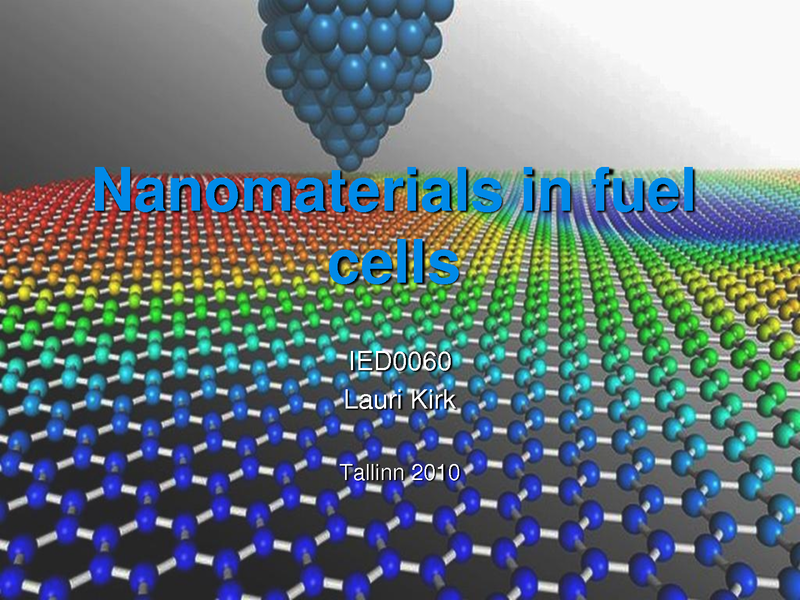 How can nanotechnology improve fuel cells? Catalysts are used with fuels such as hydrogen or methanol to produce hydrogen ions. Platinum, which is very expensive, is the catalyst typically used in this process. Companies are using nanoparticles of platinum to reduce the amount of platinum needed, or using nanoparticles of other materials to replace platinum entirely and thereby lower costs. Fuel cells contain membranes that allow hydrogen ions to pass through the cell but do not allow other atoms or ions, such as oxygen, to pass through. Companies are using nanotechnology to create more efficient membranes; this will allow them to build lighter weight and longer lasting fuel cells. Small fuel cells are being developed that can be used to replace batteries in handheld devices such as PDAs or laptop computers. Most companies working on this type of fuel cell are using methanol as a fuel and are calling them DMFC’s, which stands for direct methanol fuel cell. DMFC’s are designed to last longer than conventional batteries. In addition, rather than plugging your device into an electrical outlet and waiting for the battery to recharge, with a DMFC you simply insert a new cartridge of methanol into the device and you’re ready to go. Fuel cells that can replace batteries in electric cars are also under development. Hydrogen is the fuel most researchers propose for use in fuel cell powered cars. In addition to the improvements to catalysts and membranes discussed above, it is necessary to develop a lightweight and safe hydrogen fuel tank to hold the fuel and build a network of refueling stations. To build these tanks, researchers are trying to develop lightweight nanomaterials that will absorb the hydrogen and only release it when needed. The Department of Energy is estimating that widespread usage of hydrogen powered cars will not occur until approximately 2020. Researchers at the University of Copenhagen have demonstrated the ability to significantly reduce the amount of platinum needed as a catalyst in fuel cells. The researchers found that the spacing between platinum nanoparticles affected the catalytic behavior, and that by controlling the packing density of the platinum nanoparticles they could reduce the amount of platinum needed. Researchers at Brown University are developing a catalyst that uses no platinum. The catalyst is made from a sheet of graphene coated with cobalt nanoparticles. If this catalyst works out for production use with fuel cells it should be much less expensive than platinum based catalysts. Researchers at Ulsan National Institute of Science and Technology have demonstrated how to produce edge-halogenated graphene nanoplatelets that have good catalytic properties. The researchers prepared the nanoplatelets by ball-milling graphene flakes in the presence of chlorine, bromine or iodine. They believe these halogenated nanoplatelets could be used as a replacement for expensive platinum catalystic material in fuel cells. Researchers at Cornell University have developed a catalyst using platinum-cobalt nanoparticles that produces 12 times more catalytic activity than pure platinum. In order to achieve this performance the researchers annealed the nanoparticles so they formed a crystalline lattice which reduced the spacing between platinum atoms on the surface, increasing their reactivity. Researchers at the University of Illinois have developed a proton exchange membrane using a silicon layer with pores of about 5 nanometers in diameter capped by a layer of porous silica. The silica layer is designed to insure that water stays in the nanopores. 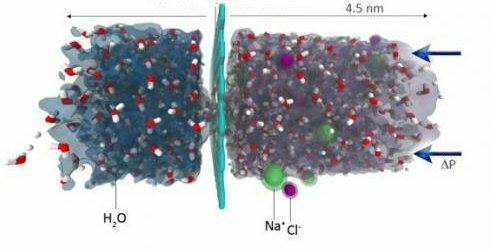 The water combines with the acid molecules along the wall of the nanopores to form an acidic solution, providing an easy pathway for hydrogen ions through the membrane. Evaluation of this membrane showed it to have much better conductivity of hydrogen ions (100 times better conductivity was reported) in low humidity conditions than the membrane normally used in fuel cells. Researchers at Rensselaer Polytechnic Institute have investigated the storage of hydrogen in graphene (single atom thick carbon sheets). Hydrogen has a high bonding energy to carbon, and the researchers used annealing and plasma treatment to increase this bonding energy. Because graphene is only one atom thick it has the highest surface area exposure of carbon per weight of any material. High hydrogen to carbon bonding energy and high surface area exposure of carbon gives graphene has a good chance of storing hydrogen. The researchers found that they could store14% by weight of hydrogen in graphene. Researchers at Stony Brook University have demonstrated that gold nanoparticles can be very effective at using solar energy to generate hydrogen from water. The key is making the nanoparticles very small. They found that nanoparticles containing less than a dozen gold atoms are very effective photocatalysts for the generation of hydrogen. Researchers at the SLAC National Accelerator Laboratory have developed a way to use less platinum for the cathode in a fuel cell, which could significantly reduce the cost of fuel cells. They alloyed platinum with copper and then removed the copper from the surface of the film, which caused the platinum atoms to move closer to each other (reducing the lattice space). It turns out that platinum with reduced lattice spacing is more a more effective catalyst for breaking up oxygen molecules into oxygen ion. The difference is that the reduced spacing changes the electronic structure of the platinum atoms so that the separated oxygen ions more easily released, and allowed to react with the hydrogen ions passing through the proton exchange membrane. Another way to reduce the use of platinum for catalyst in fuel cell cathodes is being developed by researchers at Brown University. They deposited a one nanometer thick layer of platinum and iron on spherical nanoparticles of palladium. In laboratory scale testing they found that an catalyst made with these nanoparticles generated 12 times more current than a catalyst using pure platinum, and lasted ten times longer. The researchers believe that the improvement is due to a more efficient transfer of electrons than in standard catalysts. Allowing the use of lower purity, and therefore less expensive, hydrogen with an anode made made of platinum nanoparticles deposited on titanium oxide. Using nanostructured vanadium oxide in the anode of solid oxide fuel cells. The structure forms a battery, as well a fuel cell, therefore the cell can continue to provide electric current after the hydrogen fuel runs out. Americans tend to take it for granted that when we open a tap, water will come out. Western states have been dealing with water problems for a while, but they won’t be alone for long. As drought, flooding, and climate change restrict America’s water supply, demands from population growth and energy production look set to increase, according to a report from the U.S. Government Accountability Office. These two changes squeeze our natural water reserves from both directions. The stress is becoming clear and will soon manifest as water scarcity problems all over our country. 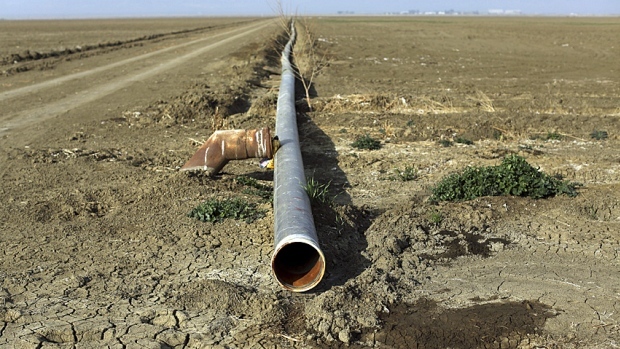 Over the last four years, Californians have gotten a big wake-up call, as drought forces them to reconsider water as a scarce commodity. The Metropolitan Water District of Southern California, the region’s water supplier, will deliver 15% less water to cities in the greater Los Angeles area starting in July. The supplier won’t cut off delivering water if demand is more than the quota, but it’ll charge local utility companies that sell residents water up to four times more than the normal rate for the excess. And naturally, the utility companies will pass the cost on to their customers. The water companies’ cuts are a reaction to California Governor Jerry Brown’s executive order that cities throughout the state reduce the amount of water they use by 25% — a groundbreaking mandate from the Governor’s office to limit water use for the first time ever. While the rest of the US hasn’t been ordered to reduce water use, that doesn’t mean we have a free pass to use as much water as we want. Many states — 4o out of 50 according to the U.S. Government Accountability Office — have at least one region that’s expected to face some kind of water shortage in the next 10 years. In some cases, shortages happen when there’s not enough fresh water suitable for human use in the lakes, rivers, reservoirs, and aquifers we can access. Rain and snowfall does replace the water we take from these sources, but that refill takes time and depends on actually getting precipitation. Drought-stricken California, for example, has a much reduced snowpack this year compared to 2010, its last near-normal year. 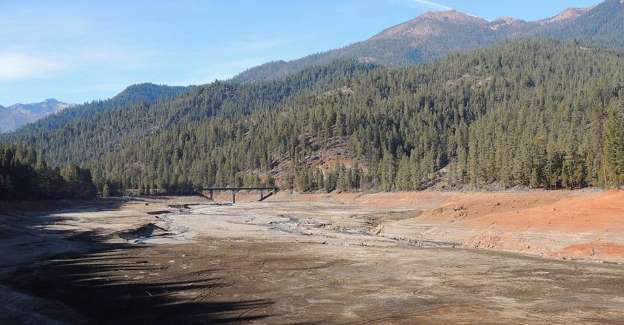 Less snowpack means less snow to melt and refill the state’s reservoirs with fresh water people can use. According to Tim Davis, the Montana Water Resources Division administrator, a water shortage could strike any part of the state in any given year, Elaine S. Povich reports for the Pew Charitable Trusts. In other cases, like Montana, water demand just keeps increasing, the 2015 State Water Plan says, while the amount of water available changes from year to year, and even within a year, depending on precipitation. The discrepancy between demand and availability means the state is likely going to encounter a water crisis in the next few years. The state is already making contingency plans for potential drought conditions in the future, Davis told Povich. In other, coastal areas of the US, rising sea levels taint fresh water coastal aquifers with salt water, which means that water can’t be consumed anymore without expensive desalination treatment. This is a looming threat for eastern and southern Maryland, according to the Government Accountability Office report. Those worries are compounded by population growth in central and southern Maryland, which is putting pressure on the water supplies there. Though water managers in Maryland don’t anticipate statewide shortages, they told the GAO some areas may struggle to find enough water for everyone moving in, because there isn’t a feasible way to dramatically increase the amount of water available. So even those of us who live in parts of the country not experiencing drought could stand to put less stress on our water supplies. In Colorado, officials told the Government Accountability Office they’re keeping an eye on the effects of fracking on the state’s water supply. Using water for fracking could contribute to local shortages in the drought-prone state, which only gets 12-16 inches of precipitation every year. Plus, a previous GAO report highlighted the risk that fracking can contaminate the water supply so humans can’t use even the water they normally could. Also out West, the U.S. Census Bureau projects the populations of Nevada and Arizona will more than double between 2000 and 2030. But those two states get some of the nation’s lowest amounts of precipitation, so more people will be vying to use water resources that already aren’t plentiful. While any given person may not be directly causing these water issues, everyone plays a role in how much drinkable water there is in the US. The U.S. Geological Survey estimated that the average American used 88 gallons of water per day in 2010, the latest year it surveyed water use. The entirety of humanity in America uses 27,400 million gallons per day around the house, for stuff like preparing food, washing clothes, flushing toilets, and watering lawns. This isn’t just a US problem, either. The water crisis is even worse in many other countries, especially those without good infrastructure to get water from rivers and aquifers. The UN estimates a fifth of the world’s population lives in an area where water is scarce, and another fourth of the world’s people don’t have access to water because countries lack the infrastructure to distribute it. By 2030, nearly half of everyone in the world will be living in countries highly stressed for water, according to UN predictions. Bank of America Merrill Lynch reports that water scarcity is our biggest problem worldwide, and projects that climate change will only make it worse. Ready access to water is not something everyone in the world can take for granted, and Americans may not be able to much longer. With most investors looking for ways to save taxes, today we are going to look at Venture Capital Corporations, and the significant tax advantages they offer investors living in British Columbia. Like many tech entrepreneurs, Joshua Reeves says he thinks his company can change the world. It may do it, too – with the way it was financed, as much as by the product itself. Reeves’ company, ZenPayroll, has raised several million dollars through a network of technology executives. His cadre numbers 56 such “angel” investors, almost all of whom are busy running their own companies. That is more than half the number of employees at ZenPayroll, which has 95 workers and opened for business in late 2012. Among ZenPayroll’s investors are people who helped found and run companies like Dropbox, Evernote, Instagram, Yelp, Yahoo and Twitter. Many are worth hundreds of millions of dollars, even a billion dollars, either on paper or actually, depending on whether their companies have entered the public market. Reeves, who sought $25,000 to $200,000 from each angel investor, is after more than their money. Each month, he sends investors requests for things he wants them to work on for him and his company, which offers online software that takes care of payroll for midsize and small businesses. It might be sales contacts, or information about how to create a corporate culture, or thoughts on new types of software. Traditionally, angel investors were just those early people who believed in someone’s dream. Sometimes they were mentors, relatives or friends of friends who would descend with money and walk away, expecting only periodic contacts or updates. But now, Reeves sees a way to exploit his angels’ innate talents. Jeremy Stoppelman, the co-founder of Yelp, says Reeves talks to him mostly about building a strong company culture. He was introduced to the company through Aaron Levie, the co-founder of Box, whom Reeves has used for other introductions. Elad Gil, who sold one company, Mixer Labs, to Twitter and is now working on a biotech startup, says he gets questions about issues like mobile application technology and business operations. Evoking passion for solving corporate payroll issues seems unlikely, but these are unlikely times in financing technology startups. Just as Tom Sawyer got other boys to whitewash a fence for him, people like Reeves may be onto a way to create an entire company: Draw on the industry’s experience, evoke previous entrepreneurs’ interests and continually expand a network of like-minded investors. That he can get these human resources says much about the state of values in technology, where money is cheap, compared with time and experience. Angel investors have been an increasingly important part of how Silicon Valley works for several years, as people have become wealthy earlier in life and corporate tools like free open-source software and cheap cloud-computing resources have lowered the cost of a startup. AngelList, which offers to match startups with early-stage investors, says it has raised $104-million from 2,673 investors to help finance 243 startups. Investors on AngelList are expected to certify that they have more than $200,000 in income for each of the last two years, or over $1-million in net worth over and above the value of their homes. In some cases, AngelList may require proof. People can invest by themselves or follow the investments of various tech executives who participate. Reeves is one of the featured investors on AngelList, and he has given money (and, he says, time) to startups like Clever, which makes online software for education, and Patreon, a service like Kickstarter to support artists. Thanks to two long tech booms in just two decades, there are lots of relatively young executives with lots of money. Many invest close to what they know, throwing millions at familiar human and technology networks. Some older investors see helping people like Reeves as a way to follow what is happening today and give back in hard-won experience. Many of the ZenPayroll angels, who have built businesses using the same technologies of cloud computing, mobility and open-source software, see themselves as part of a movement. This technology is changing society, they argue, and they like being part of as much of that as possible. All of this early-stage money can create a level of implied valuation that may be contributing to what many now say is the overvaluation of technology companies. When, after the early investing rounds, startup companies need the larger sums and corporate connections available through venture capital, they already have a valuation well above what was typical before angel investing became common. After the venture round, it has become common for some institutional investors, including private equity funds and even mutual funds, to come in before the company goes public, creating an even higher valuation. The institutional investors are betting that the initial public offering will eventually surpass even that valuation. Thus, the angel investors, some argue, are making for a disaster. 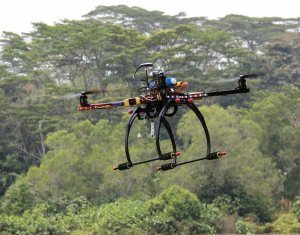 “Drones for Trees” ~ Planting ONE BILLION Trees Every Year ~ Possible? Hear the words “drone fleet” and innovative environmentalism probably doesn’t leap immediately to mind. BioCarbon Engineering wants to change that. The UK-based environmental tech firm believes that, by using drones, they’ll be able to repopulate Earth’s rapidly dwindling forest coverage at the astonishing rate of one billion trees per year. It’s an ambitious goal – one with little, if any, precedent in terms of sheer scale. There are a variety of tree-planting techniques, including planting by hand and delivering dry seeds by air. However, hand-planting is slow and expensive, and spreading dry seeds results in low uptake rates. Our solution balances these two methods. First, by planting germinated seeds using precision agriculture techniques, we increase uptake rates. Second, our scalable, automated technology significantly reduces the manpower requirements and costs. Finally, our mapping UAVs will also provide invaluable intelligence on planting patterns, landscape design and appropriate timing. Taiwanese display panel maker AUO also announced a full line-up of Quantum Dot displays ranging from 55″ to 85″ at the CITE show in Shenzhen, China. 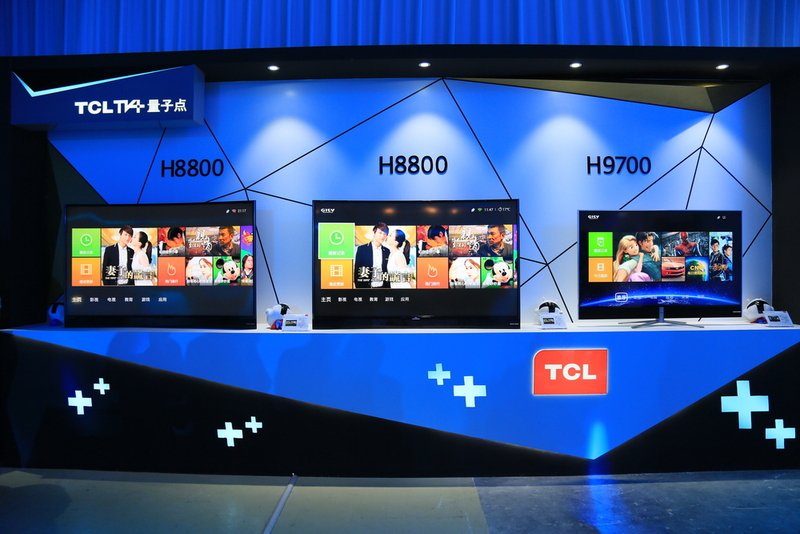 Dubbed “ALCD” for Advanced-LCD, the sets all feature UHD resolution, HDR with direct LED backlighting and Quantum Dot wide color gamut. 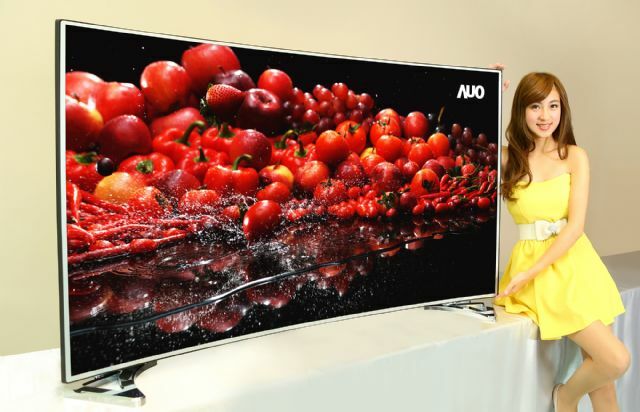 The 65″ model also comes in AUO’s favorite 3000R curvature for a more immersive experience. All models are expected to ship during the second half of 2015. Finally, Tianma NLT America announced that they introducing a new 21.3″ Quantum Dot LCD with 100% Adobe RGB color gamut coverage and 700 nit brightness. This display is designed for the medical diagnostic display market where high performance and accurate color reproduction enabled by Quantum Dot Enhancement Film are critical.